A Nursing Home Abuse Attorney Phoenix AZ Trusts Explains If Bed Sores are a Sign of Nursing Home Abuse? When families choose a nursing home facility as the place where their elderly loved one will live their last remaining days, they are looking for a place that will provide the highest quality standard of care available. Unfortunately, too many of these businesses are just that – business who put profit over the care of patients. At Rispoli Law, PLLC, we have represented many victims and their families who suffered life-threatening and painful bed sores and infections because of the substandard care they were given by nursing homes that were being paid to take care for them. When cases like these happen, our nursing home malpractice lawyers work diligently to get victims the compensation they deserve for their pain and suffering. When a person is confined to a bed or wheelchair for extended periods of time, they must be moved frequently in order to prevent pressure ulcers, also referred to as bed sores. Bed sores are extremely painful and dangerous. Many nursing home patients are unable to move on their own and must rely on nursing home staff to do it for them. When bed sores do develop – and they can even in the best of circumstances – they must be treated promptly. If not, they can become infected very easily, causing all kinds of serious medical issues. These infections can even be fatal. Bed sores that are already in the late stages when they are discovered – or when serious medical issues have developed – is a sign of nursing home negligence. When a patient is being properly cared for, then the earliest stages of bed sores will be attended, too. Nursing home staff who are attentive, who bathe the patient frequently (where any developing bedsore would be discovered) do not allow patients to develop late-stage bed sores. Nursing home staff who are negligent do allow this to happen. In addition to the pain of the bed sore, there is also that high risk of infection. Just as in any medical facility, nursing homes are full of all types of bacteria which can enter the open wound of the bed sore and attack the already compromised immune system of an elderly nursing home patient. One of the most common – and most fatal – of these infections is sepsis. Tragically, this scenario of neglect plays out time and time again in nursing homes throughout Phoenix AZ. Our nursing home attorneys have represented countless victims and their families who suffered extreme pain and other medical problems because of neglect on the part of nursing home staff. If you suspect your family member has suffered mistreatment at the nursing home they reside at, contact Rispoli Law, PLLC for help. 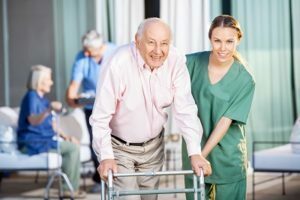 Our skilled nursing home malpractice lawyers Phoenix AZ clients recommend can discuss the details of your case, as well as what the legal options are that your family may have. Call our office today. Our firm is more than willing to talk to you about a potential legal claim for nursing home abuse, or do our best to answer any other questions you have about long term care in general. lf you need an experienced elderly abuse attorney, please do not hesitate to call 602-412-5775 (toll free 866-972-3212) or email.